In an age when the ecological devastation of our planet is forcing humanity to reevaluate its relationship to the natural world, the Christian religion is often criticized for its traditional dualistic view of a transcendent God who is separate from the "fallen" world of nature. Christian theology which emphasizes man's dominion over the Earth has been justifiably condemned for its role in the exploitation of the natural world. However, the Christian mythos contains many diverse interpretations which reveal a variety of attitudes toward nature. At this critical juncture in the Earth's history it is imperative for us to seek those aspects of Christian tradition which provide possibilities for a truly ecological spirituality. Because Christianity wields great influence as one of the major religions of the Western world, there is a critical need today for the further development of the Christian mythos which honors nature as a manifestation of the Divine. One of the sources for an ecological spirituality within Christianity is the archetypal image of the Green Man. The Green Man is the embodiment of vegetative life; he is the juiciness of the sap that rises and renews life each spring; he is the "blood" of the plant kingdom that sustains all animal life. 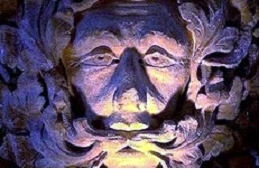 We usually see images of the Green Man as a figure dressed in green leafy attire, or as a head surrounded by leaves, or with leaves sprouting from his mouth, brow, ears, eyes, cheeks, chin or nose. He is a ubiquitous figure in the majestic cathedrals of the Middle Ages, frequently seen on columns, roof bosses, and arches peering out through leaves or disgorging them from his mouth. Although we may never know for sure what meaning this symbol had for medieval Christians, it is certain that the mythic Green Man of Christian tradition is calling to us today to renew our relationship with nature. Whenever the archetype of the Green Man appears, we also inevitably find the presence of the Divine Feminine. (3) For the Green Man and the Goddess represent the archetypal masculine and feminine polarities which are the source of created life. In ancient cultures the Green Man often took the form of the son/lover of the Goddess. For example, the vegetation gods Dumuzi, Tammuz, and Attis who were referred to as "the Green One," (4) were both the son and lover of the Goddess in her forms as Inanna, Ishtar, and Kybele. 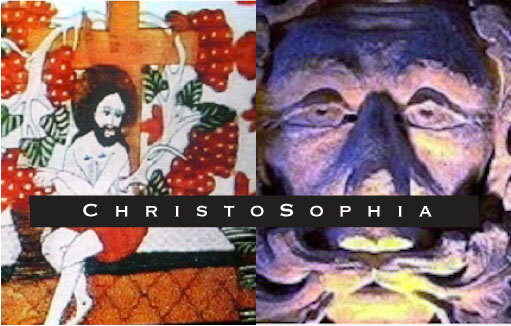 Within Christian tradition there are many allusions to the Green Man nature of Christ. Christ's archetypal similarity with the ancient vegetation gods is shown by his statements "I am the true vine" (John 15:1) and "I am the bread of life" (John 3:35 ) which are reminiscent of the gods Dionysius and Dumuzi. The central theme of the Christian mythos, the crucifixion and resurrection of Jesus Christ, closely corresponds to the ancient myths which celebrated the death and rebirth of the Green Man. The major event of the Christian liturgy - the transubstantiation of the bread and wine into the body and blood of Christ - symbolizes the sacrifice of the god in images which again remind us of Dumuzi, the god of the grain, and Dionysius, the god of the grape. Within Christianity we can see the archetypal sacrifice of the vegetation god enacted in historical time as the Passion of Christ. The return of the sacrificed god to Earth in the Spring and the corresponding rebirth of the natural world is transposed in Christianity to the resurrection of Christ at Easter which brings the greening of new life to the soul as well as nature. The search for Christ as the Green Man also reveals the presence of the Divine Feminine which is necessary to his archetype. Whereas the pagan religions of the vegetation gods honored the Goddess as the matrix of life, Christianity suppressed the role of the Divine Feminine in its image of deity. This is a basic cause of the negative attitudes toward nature which are often found in Christianity, for "Mother Nature" is the realm of the feminine. The archetypal Great Goddess has become fragmented and devalued in Christianity, but her outline is still there. The Virgin Mary, mother of Christ, can be seen as a representation of the ancient Mother Goddess who mourns her sacrificed son. As the "Mater Dolorosa," the grieving mother, Mary follows the archetypal pattern of goddesses such as Inanna, Ishtar, Isis, and Kybele in weeping for her crucified son. (8) During the Middle Ages this representation of the Virgin Mary became especially popular, and many representations of the "Pietà," the Virgin Mary mourning the body of her dead son, appeared in art and sculpture. Although the appearance of the mournful mother can be readily found within Christianity, the figure of the grieving lover which is also central to this archetypal complex is not accessible on the surface. The institutional Church, in its typical condemnation of sexuality, especially repressed the Divine Feminine in her role as consort to the dying god. However, glimpses of her presence may be found in the New Testament references to Mary Magdalene, who grieved for Jesus after his crucifixion just as the ancient goddesses mourned the death of their beloveds. The function of Mary Magdalene as the goddess-lover is also intimated in the Gospels in their description of the woman who anoints Jesus with precious oil, an act which he commends as preparation of his body for burial. This "woman with an alabaster jar," (Matthew 26:7) who is usually believed to be Mary Magdalene, is playing the role of the temple priestess who performed the ritual anointing of the god before his sacrifice. The Gospels also reveal the significance of Mary Magdalene as the first to see the resurrected Christ. Just as the ancient goddess sought her lover in the darkness of the Underworld, Mary Magdalene entered the darkness of the tomb in search of the body of her Lord. 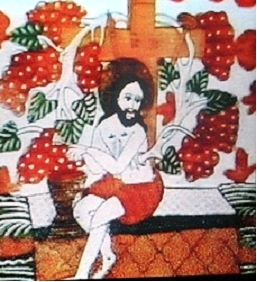 The image of Christ as the Green Man is strongly evoked in the Gospel of John where Mary Magdalene mistakes the newly risen Christ for the "gardener." Jesus said to her, "Woman, why are you weeping? Mary Magdalene's role as the grieving lover of the crucified Jesus is even more clearly indicated in the scriptures of gnostic Christianity, a variant of Christianity which was prevalent in the first few centuries. Gnostic texts such as "The Gospel of Mary" and "The Gospel of Philip" frequently depict Mary Magdalene as the beloved of Jesus, a figure reminiscent of the goddesses of antiquity. Allusions to the archetypal sacred marriage between the Green Man and the Goddess can be found in gnostic references to Mary Magdalene as the consort of Christ. But the hieros gamos is such a powerful archetype within the psyche that it makes its appearance even within the institutional Church. In the twelfth century, with the re-emergence of the Divine Feminine, images of the "Coronation of the Virgin" became prevalent in Christian art. As the Green Man motif appears prominently in the great Gothic cathedrals such as Chartres, so does Mary as the crowned Queen of Heaven appear in the portals of Chartres Cathedral. In these images of her coronation, Jesus and Mary seem to relate to each other as a bridal couple as he tenderly places the crown upon her beautiful head. (10) In medieval iconography, the Green Man as the son and lover of the Goddess makes his appearance in Jesus Christ as both the son and consort of Mary. In this simple yet profound verse, Christ as the evergreen "tree of life" can be clearly seen as the archetypal Green Man. But here the tree of life is "the apple tree," a tree which has ancient associations with the Goddess. This lovely image unites the Goddess and Christ as the Green Man. This mythological interpretation overcomes the dualities of spirit and nature, transcendent and immanent, and masculine and feminine which have so often plagued Christianity. Christ as the archetypal Green Man provides the basis for the celebration of the sacred within the natural world. This recognition of the immanence of the Divine brings the necessary complement to the transcendent God which is required for an ecological spirituality grounded in Christian tradition. For more information refer to Walking the Path of ChristoSophia: Discovering the Hidden Tradition in Christian Spirituality Chapter VII "The Green Man"
2. Ibid., pp. 439; 443; 449-450. 3. William Anderson, Green Man: The Archetype of our Oneness with the Earth (San Francisco: HarperCollins, 1990), p. 23. 4. Anne Baring and Jules Cashford, The Myth of the Goddess (New York: Arkana/Penguin, 1993), p. 411. 7. Baring & Cashford, pp. 211-212.
plant kingdom that sustains all animal life. For Christ as Green Man is an embodiment of the creative energy of the life force which causes trees to leaf, flowers to blossom, and plants to bear fruit.